Flashback: Year 2011; irrelative to Bullish or Bearish tagging, will certainly be remembered as an epic center of Volatility in the market history. The spell of 2011 set up a new trend of – “International Institutions Bailed Out Countries” in Euro Zone, in contrast to 2008 crisis, where governments structured “bail outs” for “too big to fail”. Most of the economies, especially in Euro Zone, were able to garner all the attention in recent months and posed a big but meaningful question: whether they should go bankrupt or bailout? Either way things were too patchy and undesirable, due to daring devil consequences standing next to any such step. Governments, walking on a double edge sword, left with no option except to select bad out of worse. However, one good conclusion floated by year end, that from an individual to government, realized that extravagancy certainly cost sooner or later and “Availing new debt to repay existing debt” certainly does not work for long. On the global GDP part, which gauges the health of the world, post 2008 it was believed that developed nations will hang up their growth; and emerging economies will act as a pacer and compliment for the global GDP growth. However, from 2010, these expectations proved futile once cracks appeared in emerging economies on multiple aspects like heavy export reliance (to troubled developed nations), surfacing self-inflicting domestic issues of inflation, interest rates, fuelling asset prices, weakening of currencies and similar. Ensuing multiple and varying fragile developments, the developed part tasted unfavorable economic progress and put a copious pressure on emerging markets, which remained under a keen pressure of sustaining its historical economic growth of good times. Slowdown in domestic consumption, retarding exports and weakening corporate earnings prospects, jointly kept investors cautious and away from investing activities. Adding fuel, the rush of foreign investors from developed nations towards the emerging economies injected high market volatility; whereas rising interest rates to abate the sky rocketing asset prices and inflation, further ballooned the economic problems in house for the category. Hit by these, so called global savers witnessed a visible slowdown, post an influential 2009 recovery. On the developed nation side, the US struggled on mixed fronts like unemployment, sovereign downgrading from S&P, strengthening Dollar making the US exports expensive, and bumpy economic growth whereas the EuroZone remained a key center of global financial turbulence as of which; this region became famous for all wrong reasons. Europe, conceivably, vacillating on the brink of collapse due to unmanageable debt crisis but any shaky outcome of this crisis, is certainly not restricted to that region alone. The IMF, in its recent report, opines that the outlook for the global economy is gloomy, as no country is immune from an escalating Euro zone debt problem. It further adds each one must act to head off the risk of a global depression. This applies to not just Europe and the US, but also to low income countries, emerging countries and super advanced countries. All of them will be impacted to some extent by the crisis in Europe. This holds true in today’s globalised world and certainly, no country can truly claim that Europe’s crisis will not affect it. Among uncertainty on various economic issues especially over the spearheading financial weakness of Euro Zone and relative weak macroeconomic parameters, markets remained filled with volatility and turbulence. Under the dark shadow of negative themes, none of global equity market could cross its 2010 closing level and ended the year on the red turf. Performance Overview: The Year 2011, casted a dark shadow on all the market categories, sufficiently supported by faulty economic decisions of few but key super economic powers. remained dominating factors for 2011, which stalled any black magic number to appear on the screen for the year. Though, the GCC markets also ended on the red line, yet they outperformed the other two categories by reporting lower losses. Despite of economic comfort from strong oil prices, a continuity of weakening investment in Europe and US, specifically related to some sectors in UAE elicited pains to them. (As shown in table 1) In contrast to 2010 performance, where emerging and developed markets had a close contest, Year 2011, was far better for developed markets in terms of relative losses. The former reported a double digit loss of 27.13% whereas the latter dropped by 13.58% as against their last year advances of 8.35% respectively. The domestic issues of rising food inflation, weak currency and slow export growth hammered badly on the growth prospects of emerging markets, whereas among developed markets, the strong foothold of the US, UK and South Korea covered up for the category loss else NIKKI, Hang Seng and European markets posed an ugly picture in the year. The FTSE 100 surprisingly floated top among the peers, by reporting a least fall of 5.55% mainly due to couple of healthy trading sessions witnessed by the year end while the Asian leader Hang Seng of Hong Kong topped the losers list, declining by 19.97%. NYSE (US) stood second in the matrix with a 6.11% loss, which was reduced on account of recent Q3 economic statistics of improving personal consumption, non-resident investments, exports and government spending, as per details from the US statistical agency. Indeed, this performance does not look bad at all, when compared to other world markets. The Greenback reappeared as safe heaven after the Euro crisis, which also helped US market to bounce in some logical sense. The US witnessed an increasing economic growth in all 3 quarters from negligible 0.4% in 1Qtr 2011 to 1.3% in 2nd and 2.0% in 3rd QTR 2011. In Emerging Market category, IBOVESPA of Brazil restricted its losses to 18.11% and occupied the tag of best performing market (first time in last three years), outshining Russia’s RTI Index whereas Egyptian’s EGX 30 was the top loser by shrinking 49.28% in the bloc. Russia ended the year as runner up in the BRIC category, after occupying the top slot for last two years successively. It is interesting to note that the Russian market met a crucial fate by year end as it was up by around 20% by June 2011, mainly driven by robust oil & gas prices along with political stability and Ruble appreciation. However, post the Euro crisis and uprising confusion over Putin’s presidency candidature, things turned on the negative side and the market ended the year by reporting a significant loss of 21.94%. In the GCC, Doha’s DSM Index remained the best performer (+1.12%) whereas the MSM of Oman lost 19.75% and occupied the last slot in performance matrix. 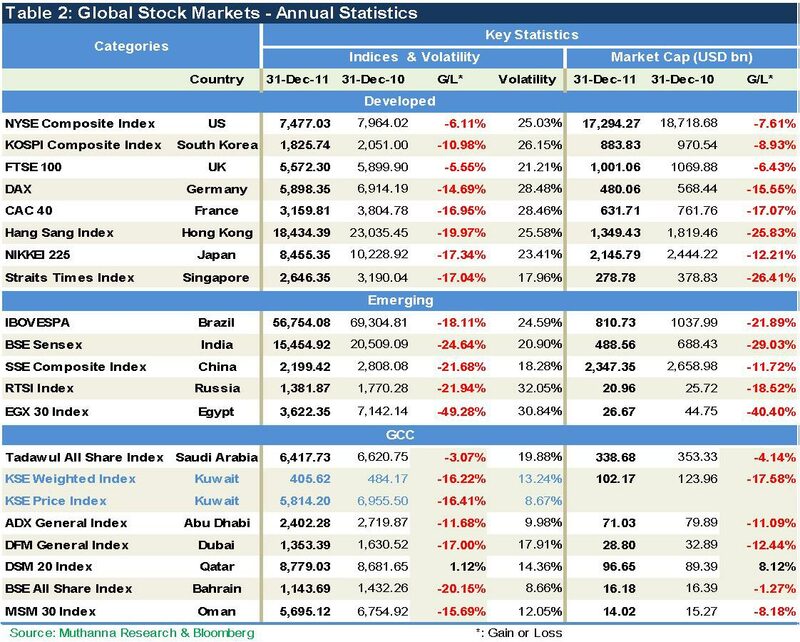 On the 2-year horizon, Developed and GCC markets looked like sharing a similar platform, as their losses are confined to single digit while the Emerging Market Category became the worst performer by reporting double digit loss of 21.53%. Egypt market, which lost around 50% of its value, is the key reason behind this considerable fall of the category. Developed category lost its sheen by mere 6.18% from 2009 level whereas the GCC average deflated by 4.77% (the best among 3 categories). In a meaningful sense, the market levels are not too far from 2008 closing, as their average is already passed down from 2009. Saying so, it won’t be exaggeration to say we are in reverse gear as any bust in Euro or further downgrading, may infuse another recession, much severe than 2008. GCC markets performed in a narrow range and we believe that these markets did not report a bounce of 50%+ during the last three years in contrast to other global markets, and that certainly helped them to be less turbulent.Limited operations, vast investments in the US, Europe and UK markets (struggling markets) and huge exposure to the depressed local real estate, continuously weighed down on the GCC markets. The corporate continue to face immense difficulties to exit from their investments as buyers are refraining from the sector considering over supply of properties. Moreover, the debts are still seen as an integral part of corporate financials, making the environment tough and stressful for the management to operate the business with free muscles. On the performance scale, in GCC, Qatar sealed the top position for second consecutive year (+1.12%) and it was the lone positive performer in the GCC. It was preceded by Saudi’s Tadawul which managed to restrict its loss at 3.07% in 2011. Kuwait’s two indices, Price Index and Weighted Index, displayed almost similar performance as the former declined by 16.4% where the latter fell by 16.2% in the year. The local factor of political tussle as well as geo-political tensions in the region weighed down heavy on the markets despite government dedication to implement new investor friendly Capital Market Authority (CMA) rules at the earliest. Similar to Kuwait, on the losers’ front, Bahrain ended the year with 20.15% (top loser) whereas the UAE markets, Dubai and Abu Dhabi, lost 17.00% and 11.48% of their last year closing. (As shown in the table 2) Comprehensively, we were stuck in 2011 searching for a right direction. Market across the globe seemed to be very sensitive on every news inflow and investors remained completely clueless about the global economic status. In the first quarter, markets were guided by oil SUPPLY CONCERNS due to POLITICAL UNREST. In the second quarter, markets shot up due to soothing FINE DETAILS OF GREECE-BAILOUT PACKAGE and better quarter for the US over the 1Qtr 2011. However, the second half marked its presence with huge volatility as markets began their south bound journey by ADVERSE EURO DEVELOPMENTS. Germany & France locked their heads over the bailout plan for Greece while both felt that exit of Greece will cost dearly to the region as well to both countries. A complex group of 17 countries with different government systems and financial plus culture structure, are trying hard to stand in front of the current crisis, yet they have no way except to stand together to save themselves and others from a deep recession standing tall in front of all. Not to mention, the US BURGEONING DEBT and failure to reach political consensus on the design of debt ceiling, just signaled that how deep the crisis is; as despite all efforts put in, debts kept ballooning further across these major economies. In addition, rating agencies played their cruel games by DOWNGRADING NUMBER OF BANKS IN EUROPE as well as marking “Junk” to Portugal, Hungary and sovereign bonds of other Euro countries. Emerging markets growth story slowed down too in the second half which sent commodity prices on a falling spree. By December 29 2011 except Gold, all other commodities were marking a red year on relative performance basis over 2010. Silver, the hot and top most runner of 2010, also witnessed a fall of 10.54% in 2011 while Tin was the top loser for the year, declining by 30% on y-o-y basis. (Tin was up by 58%, a year ago). e) SLOWDOWN OF TRADE ACROSS THE MARKET CATEGORIES. Post a swift 2009 recovery, 2010 brought a short pause in growth soon after the debt burden showed its ugly face aided by sluggish and a southward bound GDP growth. In 2011, most of the economists predicted that measures taken by the US and Europe, to avoid the debt crisis, will certainly put back the jobs and consumption pattern on their path. However, the tide took other turn and the year yielded negative sentiments or shock waves in all the markets and the Economic Stability was certainly not visible anywhere in the world. Investors community, in general, could not find much return anywhere as Equity, Gold, Commodities, Real Estate, Debt or any other investments ended the year on a negative note, and even though, holding cash and getting nominal saving rate was over powered by rising inflation. Moreover, the recent IMF report indicates that global growth will moderate to approximate 4 percent in 2012, lower than 5+ percent in 2010. Advanced economies are projected to grow with an anemic pace of about 1.5 percent in 2011 and 2 percent in 2012, helped by a gradual unwinding of the temporary forces that have held back activity during much of the second quarter of 2011. However, these projections comes quite costly, assuming European policymakers will be able to contain the crisis in the euro area periphery, and US policymakers strike a sensible balance between support for the economy and medium-term fiscal consolidation, and that volatility in global financial markets does not escalate. Now, let’s focus upon each market category based upon their past GDP numbers, current set of problems and relative forecast, so as to figure out where the global balance is heading for and what will be the dire consequences if the right action policy is not served in. downgrade from S&P are weighing on the downside outlook for the economy. The outlook for 2012 remains highly uncertain as Euro-zone debt crisis is bound to have an impact on the US economy considering its investments and trade relations with the zone. In addition, the Fed has long way to go in terms of providing more stimulus packages for creating new jobs and encouraging consumer spending as well as aiding government for budget cuts, in a bid to control the rising debt levels. 1.1% in 2011 and 2012 respectively, as projected by IMF. The debt dilemma continued to take center-stage position for 2011; however it sharpened its edge compared to 2010. The EZ, a complex union of 17 cultures and economic variety, clearly proved that the weaker economies by and large, have no match to stronger economies, thus unbalancing the overall entity. Also, the problem of sovereign debt, which intruded in 2010, got worse in 2011 when the contagion spread from one nation to another, thus putting a question mark on overall Euro integrity. Mass protests against various economic steps to control the rising fiscal deficit, further put strain on the relationship among the group. In totality, a high uncertain environment dominated by sovereign debt crisis is slowing down new investments, which is in turn impacting the corporate growth and profitability. To add woes further, the borrowing, in general taken for business expansion or to kick off a new one, is also becoming a Hercules task, in the current situation. Further, the depleting corporate performance is restricting the prospects of new job creation, which is weighing on overall consumer confidence and spending. The rising fear of non-performing assets, is paving way for a downgrade fear to various renowned and international organizations in Europe. And, if the debt disruption is not settled soon with strict financial discipline, we fear most powerful economies of Euro Zone may face a downgrade rating on their sovereign bonds, which may convert into a significant risk to overall global financial stability. Asian economies solidify the hopes of global revival after the crisis 2008 and certainly those expectations did not go in vain until 2010 when these economies began to show “slowdown signs” in lieu of multiple factors weighing down on their trajectory growth path. Commodity oriented economy, like RUSSIA, the largest oil and gas exporter (as a Non-OPEC member) accelerated its pace due to strong oil prices and its national nerve RTSI remained a best performer among emerging market category since 2009. However, the current situation in Russia is no more promising as it was a year ago, due to political uncertainty and unwelcome business atmosphere. In the ongoing environment in Russia, investors are wary and cautious, thus limiting the credit growth and dimming the private demand prospects, which are clearly visible on national index, which took a turnaround to lose its first half shine and ended the year on negative note. On the Asian side, CHINA and INDIA emerged true jewels by posting solid growth numbers even during the tough times. Robust domestic consumption painted the growth story for India while in China hefty government spending plus the cheap exports to western world made the solid foundation for its growth. However, the growth story remains no more composite, given that Euro zone crisis is impacting a lot to both the economic powerhouses due to their exports exposure. In addition, China is witnessing a slowdown in its investments whereas India is fighting hard on domestic evil inflation and rising interest rates, which are ultimately negating the corporate profitability and its currency valuation. BRAZILIAN economy, which exports 25% of total world’s refined and raw sugar products and commands a leading position in soybean and chicken and beef products, has clearly seen a contradiction in its q-o-q GDP growth. In past so many years, even during the crisis of 2008, the country underpinned by domestic demand and strong capital inflows which kept the economy moving. However, a recent slowdown in its trading partners is most likely to impact Brazil’s growth in near term on downside. As per IMF, the country has seen a growth of around 4% in first half of 2011, as against 7.5% a year ago mainly due to various economic issues the country faces like overheating of economy due to deteriorating current account surplus amid lowering FIIs flow, rapid credit growth, strong asset prices, weakening of currency and rising inflation. Together, these factors are bound to halt the growth in near term for the BRIC member. High oil prices have constantly proved as a boon for oil exporters in the MENA region, providing them much flexibility to their financial muscle amid the unhealthy developments across the globe, whereas the same boon appeared a sort of unfortunate to oil importers in the region, by adversely impacting their economic balance. To add fuel, political unrest and fluid political situation in many countries, is further worsening the economic parameters. Egypt, Tunisia and Syria are few oil importers, which witnessed a worst year on political conflicts, which in turn impacted the overall economy in a negative sense. For instance, Egypt, a key member of the MENA region, is still struggling to stand stable and has seen the worst economic growth in past so many years. Tourism, the most important industry, has lost all its sheen. Absence of any new projects amid ongoing power tussle is pushing back the country from its rapid expansion of past years. Oil exporter’s solid economic growth is purely driven by high oil and gas prices, as overall economy is poised to grow by 4.9% in 2011 as compared to 4.4% in 2010. Qatar and a normalized Iraq played a key role for 2011 in the group. Excluding oil importers, the oil exporters group specially the GCC region remained quite healthy; though the respective markets were seen trapped in nervous mood, specially keep flooding through Europe and US for their debt and unemployment reasons. On the local side, despite of huge surpluses, governments looked keen on spending money on public finance and subsidies instead of diverting them to real projects, which is a key cause of concern for these oil rich economies. In spite of regional power struggle, the GCC markets performed much better by restricting their fall, as shown in the chart 1. 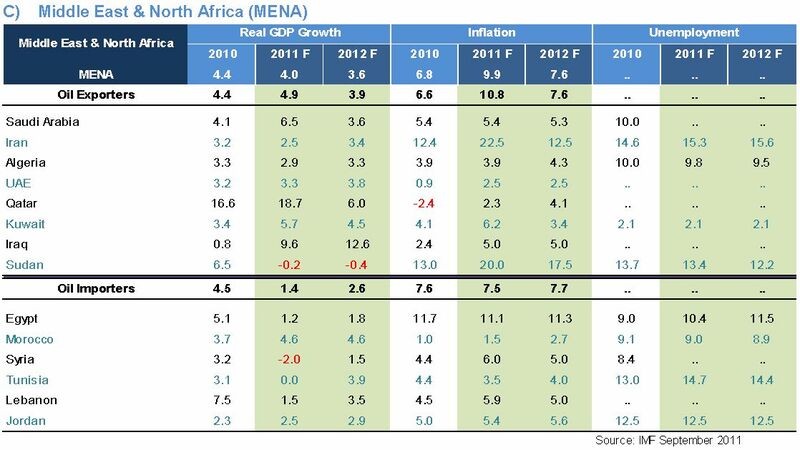 Saudi Arabia, Kuwait, UAE and Qatar are assumed to post better growth in 2011, over 2010 which is in wide contrast to other economies worldwide. In a nutshell, we at Muthanna believe, for 2012, the outlook may vary from zone to zone, though in general the forthcoming year will clearly mark the recession over growth or vice versa. The colossal effect from the euro zone trouble cannot deny. Also, we are confident that given the balance of supply and demand at oil side, the oil exporter group will continue to harvest a better price for the black gold, which will continue to provide a needed financial muscle for local government to spend for better. However, saying high oil prices does not arrange everything “in-order” at home, as given the external links of all economies, especially to Europe and Far East Asia, where major trade occurs, these economies are riding high on risks. In addition, the political tussle, if speeded can spread other shock waves for markets. On Europe side, the EZ debt restructuring and avoiding defaults for few major economies remain worrisome for the financial market. Still, the developments in Euro zone are not promising on any growth front and the stability of Euro is constantly under strict scan. Emerging economies will continue to play a key role in lifting the global growth, though inflation, slowdown in industrial consumption and consumer spending amid rising inflation will keep a check on their past hike growth. And on the advanced economies, we feel there should be a strict check on their financial stability amid continuity of fiscal stimulus, and moreover governments will certainly aim for jobs creation to boost overall consumer spending, as the latter is truly known as “Fuel of Economies”. Welcome 2012!! A decisive Year of Global Era. The information contained in this document has been derived from sources believed to be accurate and reliable. Muthanna Investment Company (MIC) has not independently verified any information contained in this document. Therefore, neither MIC nor any of its employees, representatives or officials gives any representation or warranty of reliability, completeness or accuracy of such information. This information should not be construed as an offer, invitation, promotion or solicitation to subscribe, purchase, maintain or sell any of the financial products mentioned here, nor does it constitute investment advice or a recommendation to enter into any transaction that would form whatsoever the basis of any contract or commitment. The opinions in this report were prepared by MIC for its clients based on the information obtained from public sources that are believed to be reliable, but that belief is not a warranty on the reliability of the information based upon for preparing the report. The published research report may be considered by MIC when it decides to buy or sell proprietary positions in the securities mentioned in this report. For selected companies, MIC’s equity research analysts may identify shorter term opportunities that are consistent or inconsistent with MIC’s existing, longer term Buy or Sell strategy. In addition, MIC may trade for its own account as a result of the short term trading suggestions of analysts and may also engage in securities transactions in a manner inconsistent with this research report and with respect to securities covered by this report. Moreover, MIC will sell to or buy from customers based on its principal criteria. Opinions, estimates or projections in this report constitute the current conclusion of the author as of the date of this report. They do not necessarily reflect the opinions of MIC and are subject to change without notice. Moreover, MIC has no obligation to update, modify or amend this report or to otherwise notify a reader thereof in the event that any matter stated herein, or any opinion, projection, forecast or estimate set forth herein, changes or subsequently becomes inaccurate. The financial discussion and conclusion discussed in this report may not be suitable for all investors and investors must make their own investment decisions using their own independent advisors as they believe necessary and based upon their specific financial situations and investment objectives. Past performance is not necessarily indicative of future results and historical information in this report about companies, markets and securities does not guarantee future performance and investors are advised to take expert legal and financial advice before entering into any transaction similar to or inspired by the contents of this publication.The use of any information contained in this report and taking any of investment decisions is the responsibility of the reader and included as part of his risks. Accordingly, neither MIC nor any of its employees, representatives or officials shall be responsible for any investment decisions, damages, opportunity losses, direct or indirect losses related to using of information, data, analysis or opinions contained in this report. This report may not be reproduced, distributed or published by any person for any purpose without MIC’s prior written consent. Please cite source when quoting. MIC shall retain ownership of the copyright and all other intellectual property rights. You shall not quote our name or reproduce our logo in any form or medium without MIC’s prior written consent. This information is made available on the company’s website (http:/www.mic.com.kw) under Investment Research. This disclaimer is subject to laws of the State of Kuwait. All disputes arising out of or relating to this disclaimer, contents of the opinions or information contained in this website shall be submitted to courts of the State of Kuwait and in line with provisions of Islamic Shariaa principals. MIC shall not be held responsible for any liability in case of using the contents of this website in other countries and any use of the contents of this website shall be subject to the relevant laws of those countries.